Protero Inc builds custom Scag baggers for commercial and residential use. Our catchers fit a wide variety of Scag lawn mowers including walk behind mowers and riding mowers. Our containers can hold anywhere from 7 bushels of leaves up to 22 bushels and can easily be dumped with the flip of a lever. Our zero-turn Scag bagger is ideal for residential use and lawn care companies who may have a variety of different sizes of Scag zero-turn mowers. Our grass catchers can hold up to 22 bushels of leaves in a 2-container or 3-container system. For those large jobs, our catchers for Scag utility tractors makes picking up leaves a breeze! Our Scag bagger system can hold up to 22 bushels of leaves. Our largest Scag bagger comes with a powerful PTO blower that converts a 540 RPM tractor to spin our large steel fan over 3,000 RPMs. The blower canister comes with a bolt in steel liner to protect the housing and the whole system comes off in seconds using the standard 3 point pins or quick hitch. Our front mount bagger is ideal for commercial grade walk behind Scag mowers. This front mount vacuum includes 2 30 gallon containers that can be lined with garbage bags that make bagging your customers leaves a breeze. 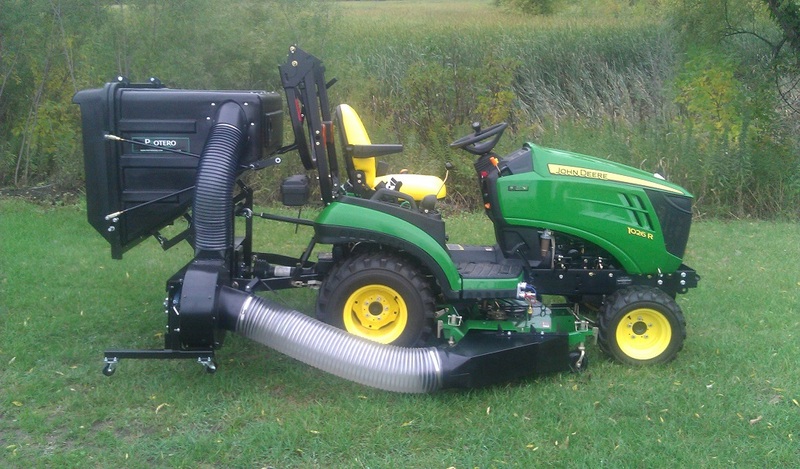 Our Scag bagger includes our commercial blower that adds up to 12 inches in width to your mower. The wide 7 inch tube allows for a smooth flow of leaves from your deck into the container system. Check out our PV18 Scag bagger in action!